Algaerium is an in-vitro aesthetic photosynthesis system of microalgae for spatial installation of algal biotechnology in the urban environment. As a collective family, each member of Algaerium represents an urban bio-repository, floating biota, in which to preserve the microorganisms for their future biotechnological use such as bio-energy. Through displacement into the urban environment, Algaerium re-contextualises the sterile environment of the algae culture laboratory. I have incorporated and manipulated the endogenous yet ‘re-programmable’ biological processes of photosynthesis and bioluminescence. Adapting molecular gastronomy technology to encapsulation of ‘ethereality’, I have created an environmentally interdependent chain mechanism of ‘metabolic’ colour creation. Algaerium contains and visualizes bioluminescence in its transparent tubular vessel. Microalgae, “Pyrocystis lunula”, are suspended in transparent growth liquid. These cells need exposure to light and darkness in order to biosynthesise bioluminescence through photosynthesis in their cells. The fluid-dynamic movement of this aquatic system agitates the microorganisms, which respond to bioluminescence. This luminous bio-property is a nocturnal behaviour controlled by the entrainable circadian rhythm of the microalgae. But here I have reprogrammed them under an artificial environment so that their nocturnal time is our daytime. Algaerium contains green microalga “Tetraselmis” in its transparent tubular vessel. This microalgae possesses striking green chlorophyll, a biosensor of light. The microorganisms are encapsulated in protective membrane through skills adapted from molecular gastronomy. The fluid-dynamic movement of the system creates a circulation of green spheres, each containing thousands of the immobilized microalgae. The encapsulation protects the cells from the otherwise toxic sensory liquid. Such surrounding yellow liquid acts as a biochemical sensor to photosynthetic metabolism of the algae by colour oscillation from yellow to purple. Microalgae in liquid suspension are encapsulated within breathing second skin created by molecular gastronomy technology. I have immobilized and suspended microbial life in sterile transparency. The microorganisms’ life is immobilized and ‘sustained’. This in-vitro environment contains the prerequisites of phototrophic life, namely light, water and CO2 into the encapsulated cells for photosynthesis. This living system of cell immobilization encourages preservation: sustenance rather than growth. What you see here is an artificial urban biota of algae displaced from different geographical climates and waters. Los científicos llevan unos cuantos años explorando las posibilidades de crear alimentos con tecnologías de impresión 3D. Y parece que esa visión futurista en la que cada casa podría tener una bioimpresora para la fabricación de alimentos podría estar más cerca. En el ámbito de la industria aeroespacial es donde más interes hay por crear una impresora 3D capaz de imprimir alimentos para los astronautas durante sus largas estancias en el espacio. La NASA anunció en mayo financiación para el desarrollo de una bioimpresora 3D. Pero cada vez están surgiendo más ejemplos de impresoras de alimentos más allá del ámbito meramente experimental. La semana pasada comentaba el ejemplo de “The Sugar Lab”, fabricante de dulces de azucar mediante impresión 3D. Otro ejemplo más de los avances en este campo es el de la investigadora Marin Sawa, que está trabajando en colaboración con el Imperial College de Londres para desarrollar una nueva tecnología de impresión 3D de microalgas. El resultado de esta investigación es la bioimpresora Algaerium, un dispositivo que permite imprimir combinaciones de diferentes algas -Chlorella, Spirulina y Haematococcus- según las necesidades nutricionales. En un principio, las algas pueden resultar un alimento poco apetecible, pero son muy nutritivas, ricas en minerales y vitaminas. Las diferentes cepas de algas tienen unos colores característicos que podemos asociar con su valor nutricional. Por ejemplo, la Chlorella es una alga muy saludable por su alto contenido en clorofilas, de ahí su pigmentación verdosa. Estas especies ya se cultivan a escala industrial y son cada vez más demandadas en la industria alimentaria. bio-power in the form of light from bioluminescent algae. 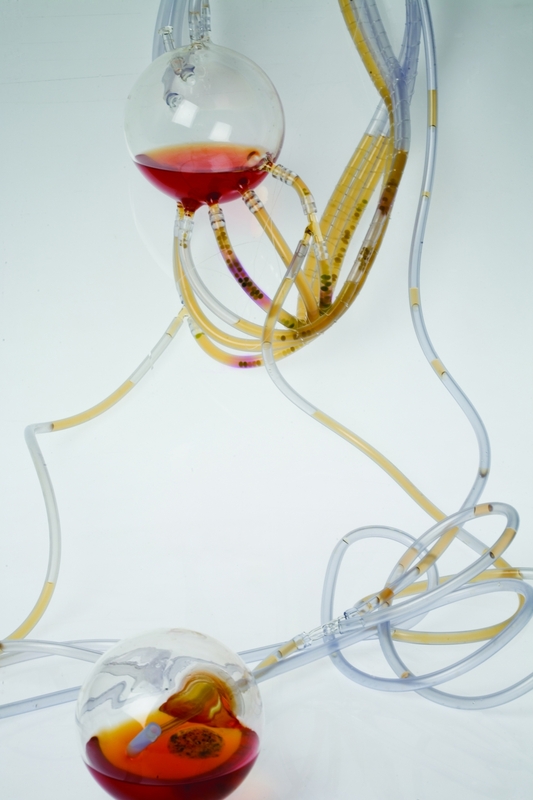 Algaerium is made up of a modular structure that pumps micro algae through clear flexible tubes. The movement within the system agitates the bioluminescent algae and makes it glow. Algae is traditionally grown on an industrial scale, but Algaeruim brings this powerful green marvel into the home environment for living light. THE BIOPRINTER ENVISIONS AN IMMEDIATE FUTURE IN WHICH ALGAE ‘FARMING’ FORMS A NEW PART OF URBAN AGRICULTURE TO REINFORCE FOOD SAFETY IN OUR CITIES.